Tianshu moved to Los Alamos from Toronto, Canada in November 2006 and joined LA Mountaineers in December 2006. Tianshu's first year with LA Mountaineers has been a learning experience for her. 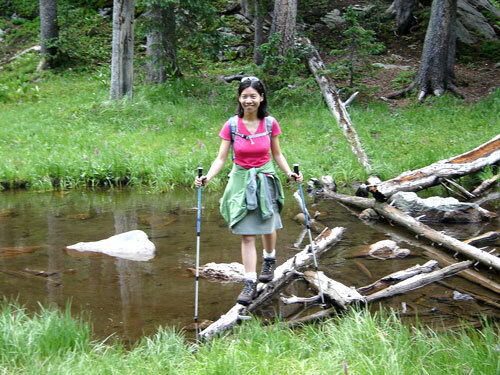 Many of her "first time" outdoor activities occurred with this group of amazing people such as first time hiking in the canyon and in the mud, first time backpacking and starting a campfire, first time setting up a tent and sleeping in the wild nature. A road runner of a big city transforming into a backpacker of the wild country, she couldn't have imagined how much she would love hiking on rugged trails, climbing high mountains, and encountering wild flowers and animals. She is looking forward to learning and experiencing more with the LA Mountaineers. Tianshu is often asked what her name means in Chinese. Tian means sky and Shu means comfortable. The name is from a Chinese poem. The poet was swimming across the Yangzi River. He looked at the sky and felt so comfortable. Tianshu likes wilderness and city life. She loves traveling and fine dining. She enjoys writing travel journals before going to bed until running out of words and reading Travel edition on the New York Times at Sunday morning with a cup of coffee. Tianshu is a chemist by training. She is currently employed in the hydrogen production project as a postdoctoral fellow at Los Alamos National Laboratory.